As much as I love bright and bold colors, I appreciate that not everyone has the same tastes. 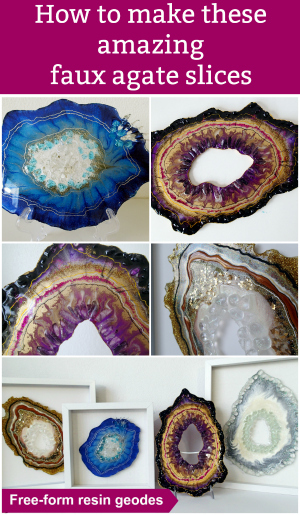 In this freeform resin geode I decided to use more neutral and lighter colors, that could fit in with any home or decor. I have to make my art pay for itself so with this piece I tried to be more ‘commercial’. I have to admit though, taking good photos of this piece has been a challenge. I can’t seem to get it right. The silver always seems to show up more darkly than in real life and I can’t capture the difference in the center between the pearl and the white. I probably need to do a better job in photo editing to get the colors just right. I used a shimmery pearl white, a bright white, and a metallic silver for my colorants, along with a crystal glitter and a silver. The stones were crushed glass in the center and glass nuggets around the outside. I made this in a silicone mold that I made myself and once it was removed from the mold, I added another line of the glass gems around the center to give it a little more dimension, and hopefully make it look a little more like a geode slice. When it comes to displaying these pieces, do you have a favorite way? I have a stand which I was using and I think they can look good this way. They can be picked up and admired, you can really feel the glossy parts, the texture, move it around to admire the shine from the glitter. But is this the best way to sell these pieces? I’ve had a free-standing one in my Etsy store for some time now and it’s not sold. I’m wondering if perhaps it needs something more to make it look more like an art work. So I bought these nice deep shadow box frames and added it there. I used a couple of strips of foam underneath to raise it away from the backing slightly. It still has a very 3d look in the frame, you can still see the textures, but now perhaps it looks more obvious what you are supposed to do with it, from a customer’s point of view. It obviously hangs on the wall. It’s easier to keep clean, no little hands can grab it. What do you think? My husband is so used to seeing me create bright and bold art works that this one rather surprised him. He says he’s not sure he likes it. A bit plain? What do you think about the colors and the presentation of this piece? 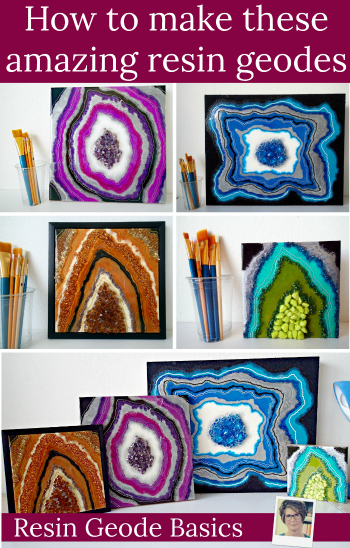 How do you like to display your freeform geodes?